Miami Today is the premier source of information for the executives and companies of Miami, Florida, and vicinity. With a circulation of more than 28,000 copies, Miami Today is the unchallenged leader for the important information business leaders rely upon. All of this makes Miami Today the prime location for advertisements. Miami Today’s advertising professionals can help you achieve your goals. For information about Legal Advertising, email legals@miamitodaynews.com or call 305-358-2663. Once the form is received you will be contacted with a price quote and payment information. Please contact us about other categories of notices. Applicant: The applicant for this project is Green Biofuels, LLC. The applicant’s authorized representative and mailing address are: Ms. Cristhine Fuga Roso, Managing Partner, Green Biofuels, LLC, Green Biofuels, 3123 NW 73 Street, Miami, Florida 33147. 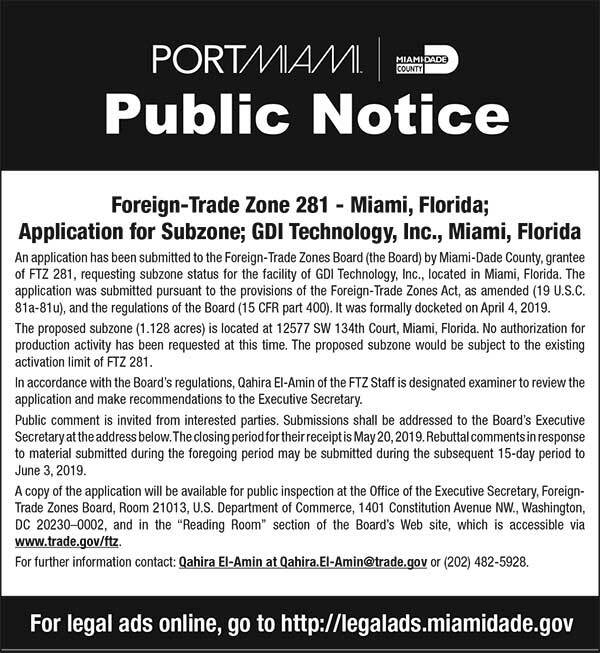 Facility Location: Green Biofuels, LLC proposes to construct a biodiesel production facility to be located in Miami-Dade County at 3123 NW 73 Street in Miami, Florida. Project: With this project, the applicant requests an air construction permit for the installation of equipment necessary for a “batch” type biodiesel production facility with a maximum capacity of 4.8 million gallons of biodiesel product per year. The Plant is designed to process used cooking oil (UCO) as feedstock for the biodiesel production. The UCO is purchased from companies that collect the oil from restaurants and industries that use it to process food. Permitting Authority: Applications for air construction permits are subject to review in accordance with the provisions of Chapter 403, Florida Statutes (F.S.) and Chapters 62-4, 62-210 and 62-212 of the Florida Administrative Code (F.A.C. ), and Chapter 24, Code of Miami-Dade County. The proposed project is not exempt from air permitting requirements and an air permit is required to perform the proposed work. The Permitting Authority responsible for making a permit determination for this project is the Miami-Dade County Department of Regulatory and Economic Resources (RER), Division of Environmental Resources Management, Air Quality Management. The RER’s physical address is: 701 NW 1 Court, Suite 200, Miami, Florida 33136. The RER’s mailing address is: 701 NW 1 Court, Suite 400, Miami, Florida 33136. The RER’s phone number is (305) 372-6925. Project File: A complete project file is available for public inspection during the normal business hours of 8:00 a.m. to 5:00 p.m., Monday through Friday (except legal holidays), at the physical address indicated above for the RER. The complete project file includes the Draft Permit, the Technical Evaluation and Preliminary Determination, the application and information submitted by the applicant (exclusive of confidential records under Section 403.111, F.S.). Interested persons may contact the RER’s project engineer for additional information at the address and phone number listed above. In addition, electronic copies of these documents are available on the following web site: https://fldep.dep.state.fl.us/air/emission/apds/default.asp. Notice of Intent to Issue Air Permit: The RER gives notice of its intent to issue an air construction permit to the applicant for the project described above. 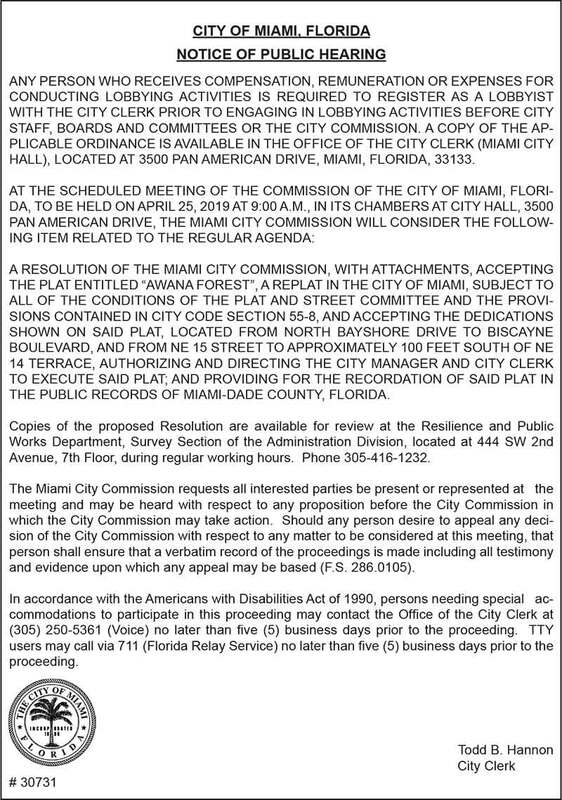 The applicant has provided reasonable assurance that operation of proposed equipment will not adversely impact air quality and that the project will comply with all appropriate provisions of Chapter 24, Code of Miami-Dade County, and Chapters 62-4, 62-204, 62-210, 62-212, 62-296 and 62-297, F.A.C. The RER will issue a Final Permit in accordance with the conditions of the proposed Draft Permit unless a timely petition for an administrative hearing is filed under Sections 120.569 and 120.57, F.S. or unless public comment received in accordance with this notice results in a different decision or a significant change of terms or conditions. Comments: The RER will accept written comments concerning the proposed Draft Permit for a period of 14 days from the date of publication of the Public Notice. Written comments must be received by the RER by close of business (5:00 p.m.) on or before the end of this 14-day period. If written comments received result in a significant change to the Draft Permit, the RER shall revise the Draft Permit and require, if applicable, another Public Notice. All comments filed will be made available for public inspection. Petitions: A person whose substantial interests are affected by the proposed permitting decision may petition for an administrative hearing in accordance with Sections 120.569 and 120.57, F.S. Petitions filed by any persons other than those entitled to written notice under Section 120.60(3), F.S., must be filed within 14 days of publication of the Public Notice or receipt of a written notice, whichever occurs first. Under Section 120.60(3), F.S., however, any person who asked the RER for notice of agency action may file a petition within 14 days of receipt of that notice, regardless of the date of publication. A petitioner shall mail a copy of the petition to the applicant at the address indicated above, at the time of filing. 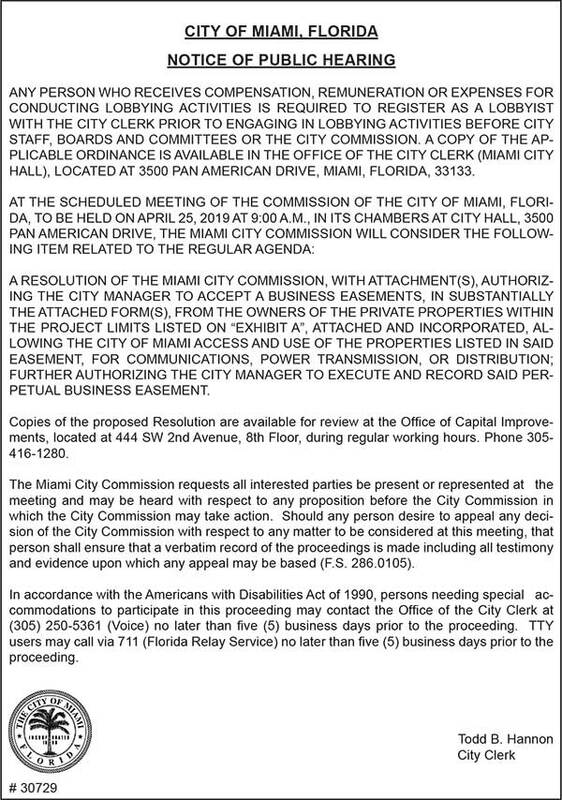 A petition for administrative hearing must contain the information set forth below and must be filed (received) with the RER Clerk in Miami-Dade County Department of Regulatory and Economic Resources, Division of Environmental Resources Management, Air Quality Management at 701 NW 1 Court, Suite 400, Miami, Florida 33136, before the deadline. The failure of any person to file a petition within the appropriate time period shall constitute a waiver of that person’s right to request an administrative determination (hearing) under Sections 120.569 and 120.57, F.S., or to intervene in this proceeding and participate as a party to it. Any subsequent intervention (in a proceeding initiated by another party) will be only at the approval of the presiding officer upon the filing of a motion in compliance with Rule 28- 106.205, F.A.C. A petition that disputes the material facts on which the RER’s action is based must contain the following information: (a) The name and address of each agency affected and each agency’s file or identification number, if known; (b) The name, address, any email address, telephone number and any facsimile number of the petitioner; the name, address any email address, telephone number, and any facsimile number of the petitioner’s representative, if any, which shall be the address for service purposes during the course of the proceeding; and an explanation of how the petitioner’s substantial interests will be affected by the agency determination; (c) A statement of when and how each petitioner received notice of the agency action or proposed decision; (d) A statement of all disputed issues of material fact. If there are none, the petition must so state; (e) A concise statement of the ultimate facts alleged, including the specific facts the petitioner contends warrant reversal or modification of the agency’s proposed action; (f) A statement of the specific rules or statutes the petitioner contends require reversal or modification of the agency’s proposed action including an explanation of how the alleged facts relate to the specific rules or statutes; and, (g) A statement of the relief sought by the petitioner, stating precisely the action the petitioner wishes the agency to take with respect to the agency’s proposed action. A petition that does not dispute the material facts upon which the RER’s action is based shall state that no such facts are in dispute and otherwise shall contain the same information as set forth above, as required by Rule 28- 106.301, F.A.C. Because the administrative hearing process is designed to formulate final agency action, the filing of a petition means that the RER’s final action may be different from the position taken by it in this Public Notice of Intent to Issue Air Permit. Persons whose substantial interests will be affected by any such final decision of the RER on the application have the right to petition to become a party to the proceeding, in accordance with the requirements set forth above. Mediation: Mediation is not available in this proceeding. YOU ARE HEREBY NOTIFIED that a Notice of Intent to Deny Application for Loan Originator License (with Notice of Rights) has been issued by the State of Florida, Office of Financial Regulation, for failure to comply with certain requirements of Chapter 494, Florida Statutes, and Rule 69V-40.00112, Florida Administrative Code. As such, your written defenses, if any, must be received at the address provided below by 5:00pm ET, on May 4, 2019. FAILURE TO RESPOND AS PRESCRIBED will result in a Final Order being entered against you regarding the allegations contained in the Notice of Intent to Deny Application for Loan Originator License. YOU ARE HEREBY SUMMONED and required to answer the Complaint regarding Termination of Parental Rights and Adoption in this action filed March 11, 2019, a copy of which is on file with the Dorchester County Family Court Clerk, and to serve a copy of your Answer to the Complaint on the Plaintiffs or their attorneys at Condon Family Law, LLC, at their office at 4840 Chateau Avenue, North Charleston, South Carolina 29405, tel. #843-225-7288, within thirty (30) days after the service, exclusive of the date of service. If you fail to answer the Complaint within the time aforesaid, such constitutes consent to adoption by the Plaintiffs and forfeiture of all rights and obligations with respect to A.T. and the Plaintiffs will apply to the Court for judgment by default for the relief demanded in the Complaint. 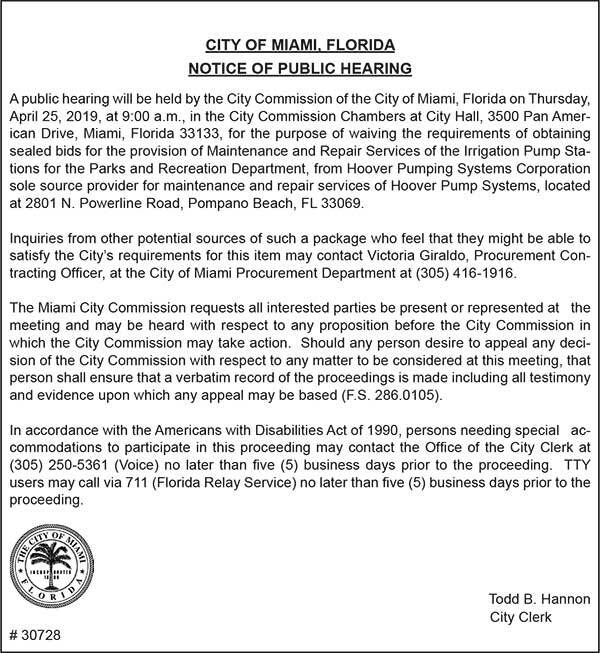 Notice Under Fictitious Name Law Pursuant to Section 865.09, Florida Statutes NOTICE IS HEREBY GIVEN that the undersigned, desiring to engage in business under the fictitious name of MigracionSOS, located at 1445 16th Street, Unit 1205, in the County of Miami-Dade, in the City of Miami Beach, Florida, 33139, intends to register the said name with the Division of Corporations of the Florida Department of State, Tallahassee, Florida. Dated at Miami, Florida, this 4th day of April, 2019. Applicant: The applicant for this project is Continental Motors D/B/A United Turbine. The applicant’s authorized representative and mailing address are: Mr. Valentino Passarelli, Assistant Vice President, Continental Motors D/B/A United Turbine, 8950 NW 79th Avenue, Medley, Florida 33166. Facility Location: Continental Motors D/B/A United Turbine is an existing but unpermitted jet engine repair facility that is located in Miami-Dade County at 8950 NW 79th Avenue, Medley, Florida 33166. Project: With this project, the applicant requests an after-the-fact air construction permit for equipment associated with a jet engine repair facility. Details of the project are provided in the application and the enclosed Technical Evaluation and Preliminary Determination. Project File: A complete project file is available for public inspection during the normal business hours of 8:00 a.m. to 5:00 p.m., Monday through Friday (except legal holidays), at the physical address indicated above for the RER. The complete project file includes the Draft Permit, the Technical Evaluation and Preliminary Determination, the application and information submitted by the applicant (exclusive of confidential records under Section 403.111, F.S.). Interested persons may contact the RER’s project engineer for additional information at the address and phone number listed above. In addition, electronic copies of these documents are available on the following web site: http://www.dep.state.fl.us/air/emission/apds/default.asp. Petitions: A person whose substantial interests are affected by the proposed permitting decision may petition for an administrative hearing in accordance with Sections 120.569 and 120.57, F.S., however, any person who asked the RER for notice of agency action may file a petition within 14 days of receipt of that notice, regardless of the date of publication. A petitioner shall mail a copy of the petition to the applicant at the address indicated above, at the time of filing. 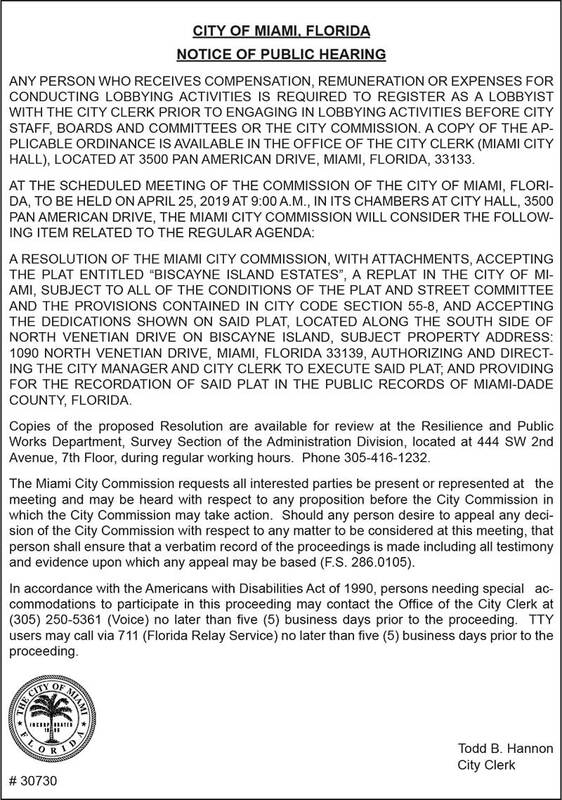 A petition for administrative hearing must contain the information set forth below and must be filed (received) with the RER Clerk in Miami-Dade County Department of Regulatory and Economic Resources, Division of Environmental Resources Management, Air Quality Management at 701 NW 1 Court, Suite 400, Miami, Florida 33136, before the deadline. The failure of any person to file a petition within the appropriate time period shall constitute a waiver of that person’s right to request an administrative determination (hearing) under Sections 120.569 and 120.57, F.S., or to intervene in this proceeding and participate as a party to it. Any subsequent intervention (in a proceeding initiated by another party) will be only at the approval of the presiding officer upon the filing of a motion in compliance with Rule 28- 106.205, F.A.C.